If you’re poking through a modern Windows Server OS such as 2012 R2 or 2016 and wondering where the Share and Storage Management went then you’re not alone. Most people hunting for open files in Windows Server instinctively go to Share and Storage Management since that’s where you found things like that in days past. Since at least Server 2008 Microsoft has introduced Open File management via the Computer Management and slowly phased out the Share and Storage Management, which is now completely absent in Server 2016. 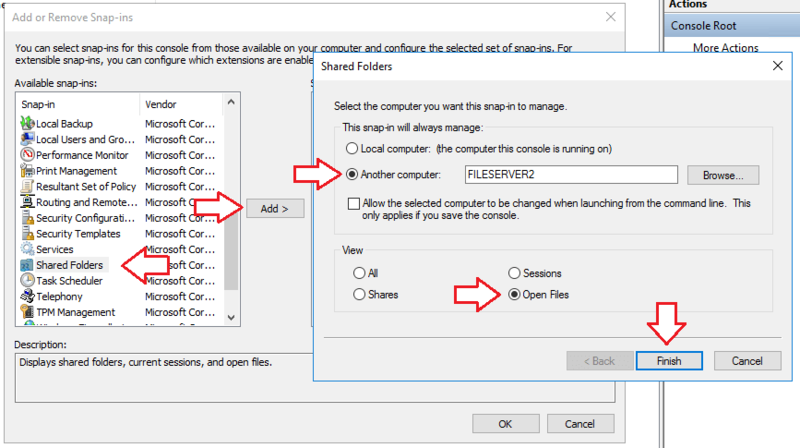 The easiest way to see what shared folders and files are open on your system (or a remote system) is to use Computer Management. Right click your start menu button and click on Computer Management. You can also search for Computer Management or Compmgmt.msc in your start menu. You will now see a list of all the open directories and files by other users on your server. If you need to close any of these files so they aren’t locked anymore (for copying, deleting, updating, etc…) just right click on any of the files or folder and click Close. Another easy way to view files that are open on a system is to use the Resource Monitor. If you’ve never used the Resource Monitor I highly recommend poking around in it a bit. It’s a pretty powerful tool that ships with Windows and is greatly underutilized by most (in my opinion). Search for Resource Monitor in your start menu and click on it. Expand Disk Activity to view a list of processes and the associated Open File location. The drawback to using the Resource Monitor to view Open Files is you cannot close the open files. It does at least tell you where they are located. If you need to close an open file or a file locked by a system process you can use free tools such as IOBit Unlocker. Once the software is installed you just need to right click on the file or directory that is locked (which you can find using one of the methods above) and click on IOBit Unlocker in the context menu. You’ll be presented with a screen similar to below that will show selected Files/Folders, what processes are locking them, and a button to perform the unlocking of the file.